The London Interbank Offered Rate (LIBOR) is an interest rate based on the average interest rates at which a large number of international banks in London lend money to one another. The official LIBOR rates are calculated on a daily basis and made public at 11:45 (London Time) by the ICE Benchmark Administration (IBA). 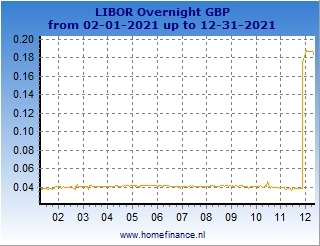 We publish the LIBOR rates on this website with a one day delay (we are not allowed to publish realtime LIBOR rates). The daily reported interest rates are the mean of the middle values. The rates are a benchmark rather than a tradable rate, the actual rate at which banks will lend to one another continues to vary throughout the day. The LIBOR rates come in differtent maturities (overnight, 1 week and 1, 2, 3, 6 and 12 months) and different currencies (the euro, US dollar, British pound sterling, Japanese yen, and Swiss franc). In the past, the BBA published LIBOR rates for 5 more currencies (Swedish krona, Danish krone, Canadian dollar, Australian dollar and New Zealand dollar) and 8 more maturities (2 weeks, 4, 5, 7, 8, 9, 10 and 11 months). 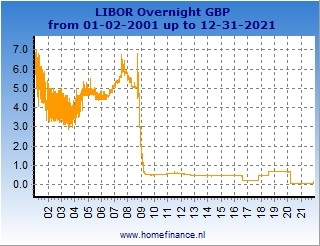 On this page we show the British pound sterling LIBOR rates. The sterling LIBOR rates can be considered as the interbank cost of borrowing funds in the British pound sterling. The LIBOR interest rates are being used as a reference rate for a lot of financial products, for example derivatives like swaps. A lot of banks use the LIBOR interest rates also to determine their rates on products like mortgages, savings accounts and loans. In the following table we show the current sterling LIBOR interest rates (one day delay, daily updated). The left charts show all the sterling LIBOR rates from the start. The right charts show the rates during the latest 12 months. You can select all available sterling LIBOR rates (maturities).